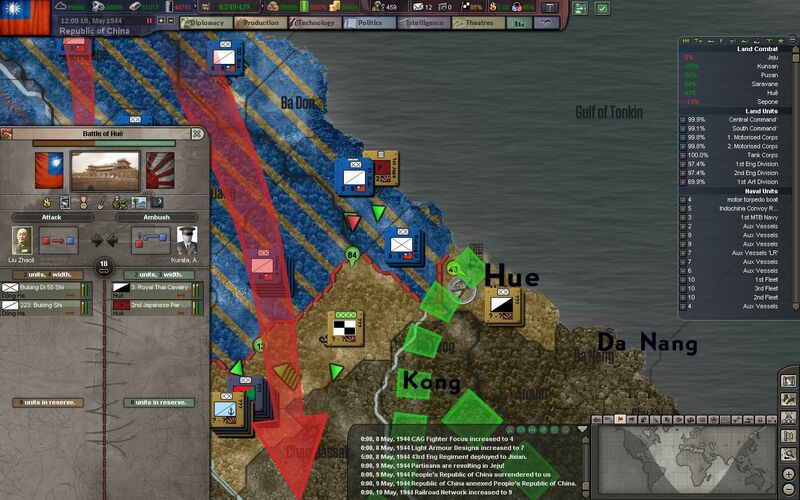 Hi all, and thanks for reading Episode 14 of my Republic of China AAR in BlackICE 8.6. If you missed the previous episodes, they are linked below. 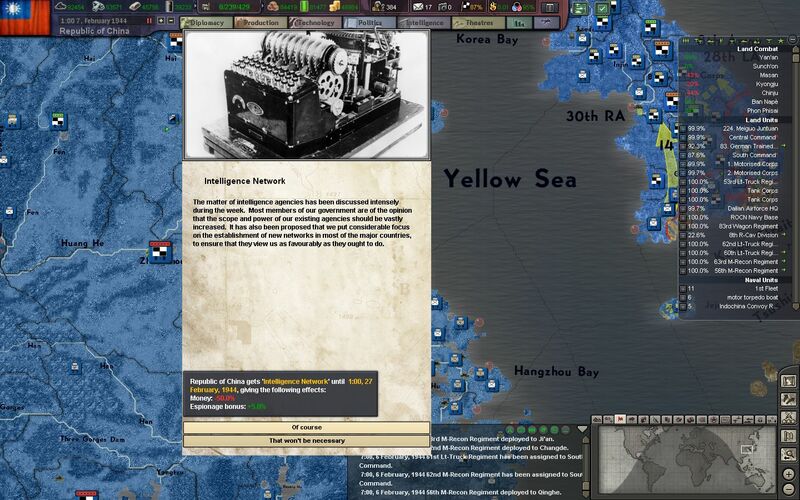 Operation Hacksaw begins with the withdrawal of our last divisions from the city of Pusan. Over 200,000 men of Army Group Korea have perished in the rubble of the city, which has been ground to dust by the Imperial Japanese Navy. The remainder of the cities inhabitants, which had relocated to the outskirts of the city after the initial assault, retreat with our troops. 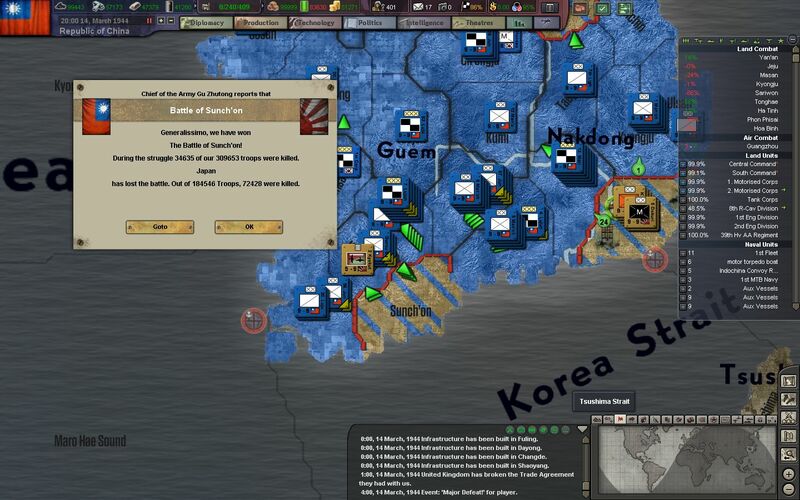 Once again the Japanese set out to conquer the Korean Peninsula. 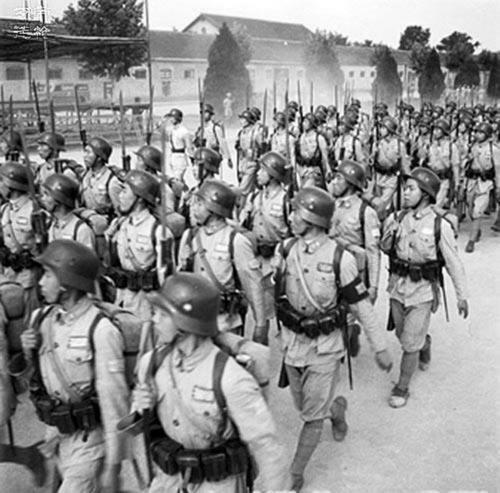 Over 250,000 Japanese troops begin to occupy Pusan and establish a perimeter around the city. 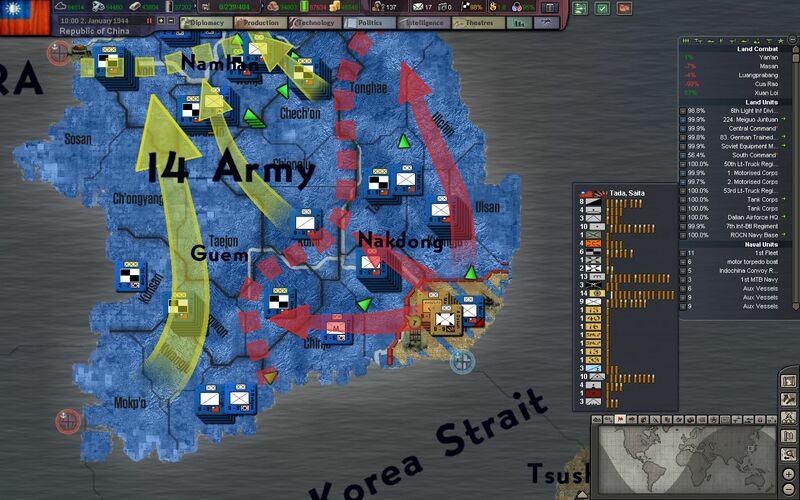 Thankfully, our ordered retreat has allowed us to set up a defensive line around Pusan. The defensive lines ordered by Operation Hacksaw may not be needed after all. Meanwhile, in the mainland, the horrors of war are no longer experienced first hand. We begin rebuilding our country with new training, medical, and urban centers. 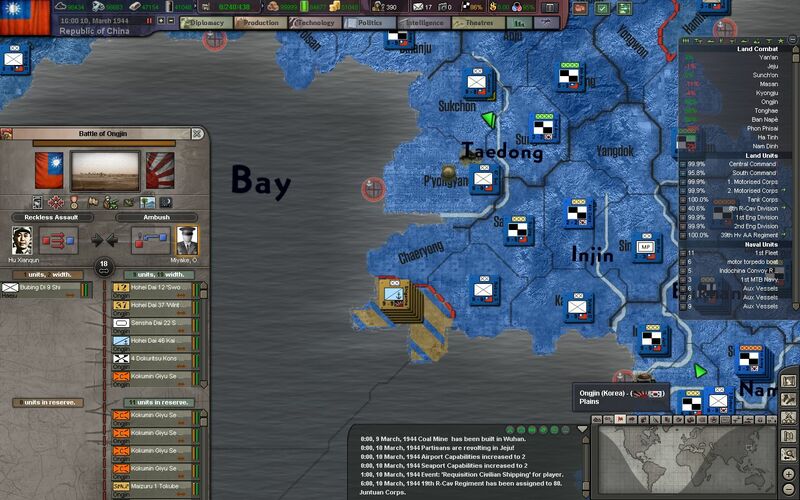 The first target of this investment is the northern city of Xinjing, which was only recently recaptured from the Japanese. 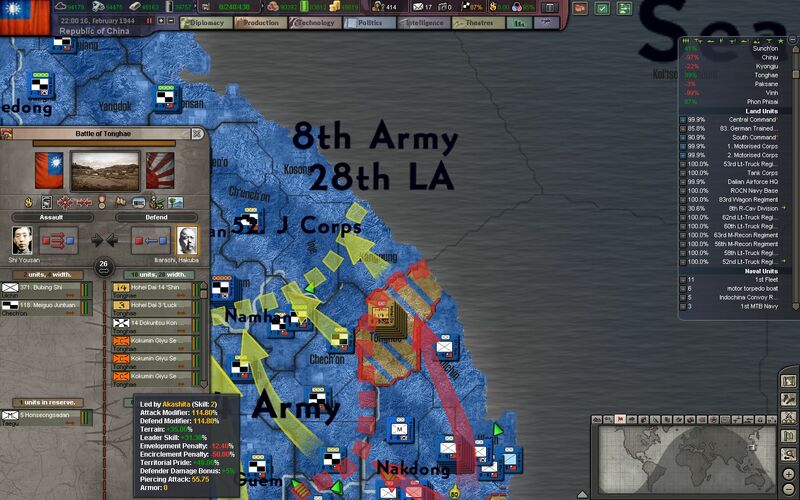 In the South, our troops have stemmed the tide of the recent Japanese offensive and have now nearly pushed back the Japanese to the Song Ca River. The newly built heavy cruisers Pao Nim and Nan Shin are deployed to the 2nd Fleet at Dalian. 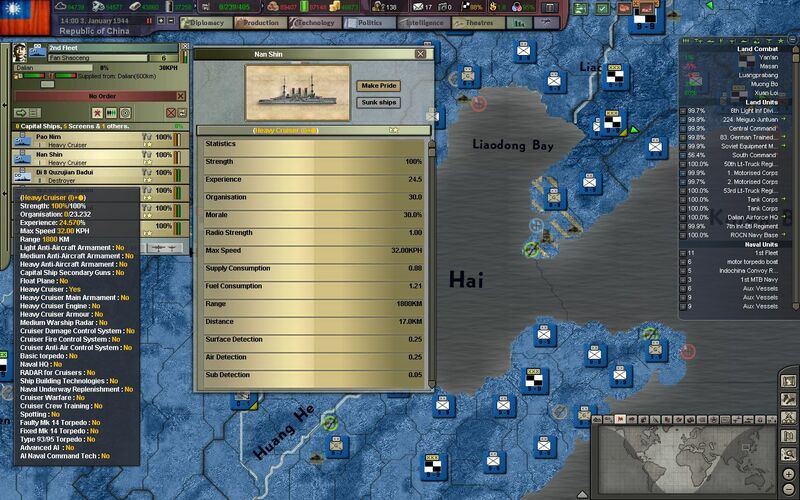 Chief of the Navy Ouyang Ge has focused most of our production and research efforts on heavy and light cruisers, in order to expedite the build up and modernization of the Republic's Navy. A new governmental complex is constructed in the center of Chongqing, to replace the warehouses and shacks that the RoC initially used after their retreat west. 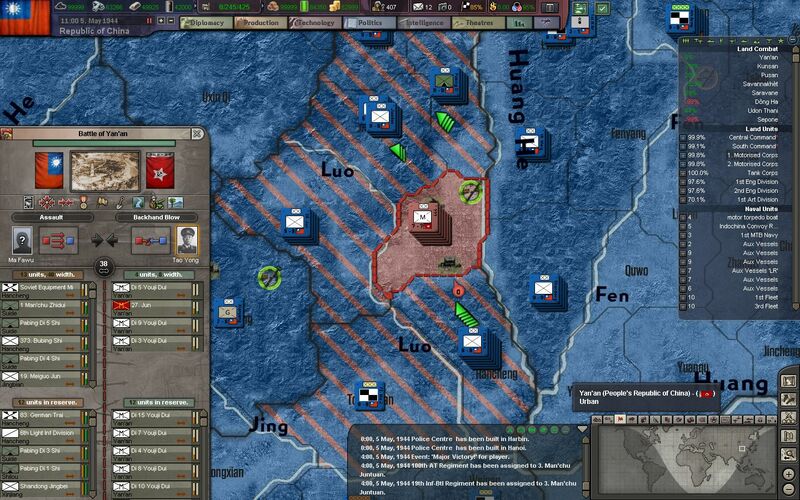 The decision not to relocate back East to Nanjing is controversial, but practical as the threat of Japanese invasion or bombing is still severe. The push back to the Song Ca River has inspired our commanders in the South to plan a grander offensive - and not just a war that is designed to hold the enemy back. 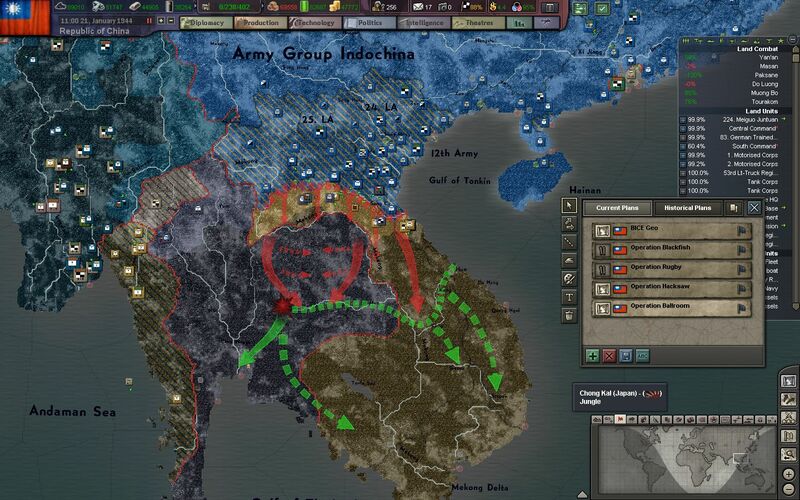 Operation Ballroom will secure Indochina from the Japanese, by first moving through the mountains and thick jungle of Cambodia, and then finally cutting the Japanese forces in two at Bangkok. 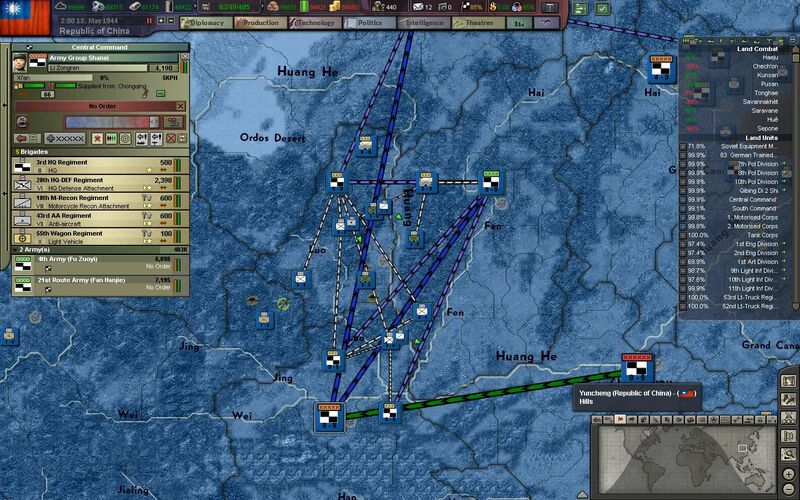 Secondary thrusts will be made down the coast from Bangkok and the city of Hue, along the Gulf of Tonkin. 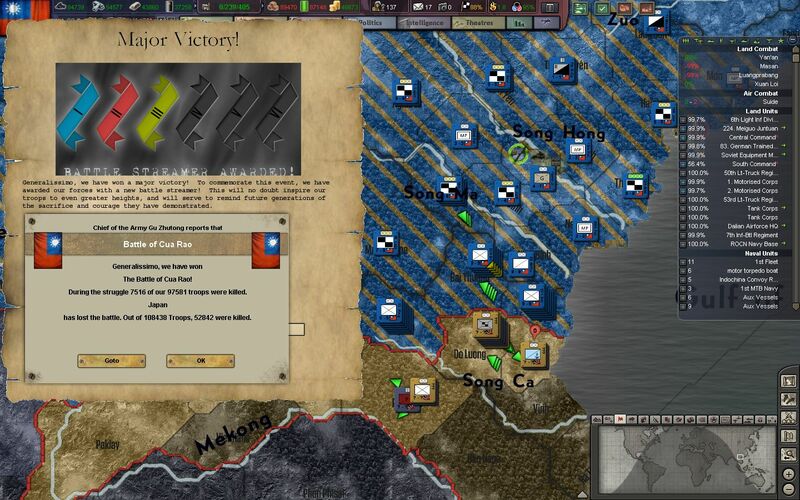 The first major obstacle in Operation Ballroom is the crossing of the Mekong River, which is currently under heavy guard of the Japanese. 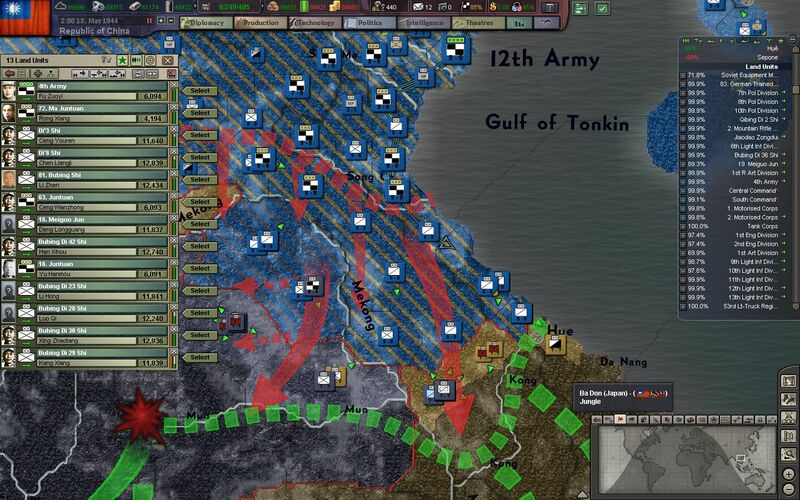 We expect the crawl down the coast towards Hue to be an easier battle, but that drive is of lesser importance than the direct drive to Bangkok. 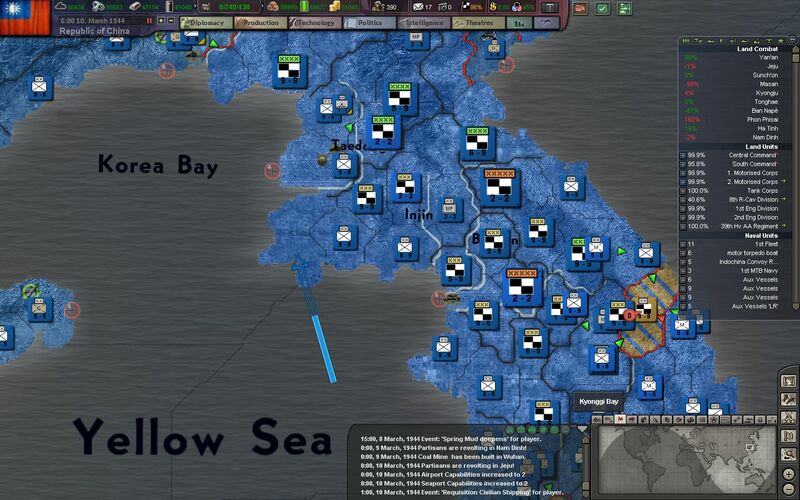 Our recent focus on Pusan in Korea has left the southwestern coast of Korea undefended, and more troops of the IJA land disembark onto the peninsula. 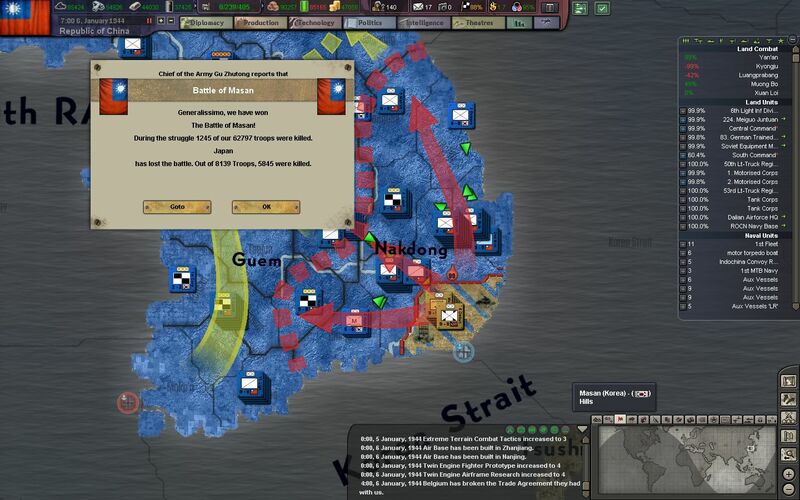 The annihilation of the Kwantung Army has forced the Japanese to rebuild their army with conscripts. 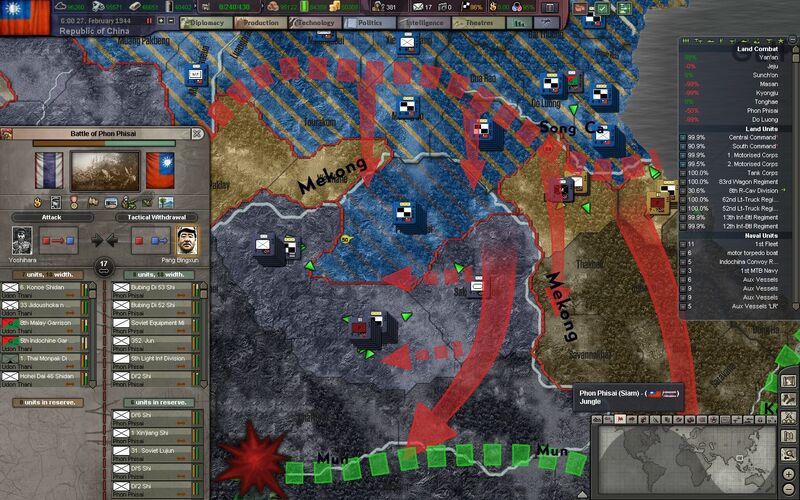 Along with them are colonial units, headquarter defense battalions, and reorganized Kwantung divisions, which are all pressed into offensive service. 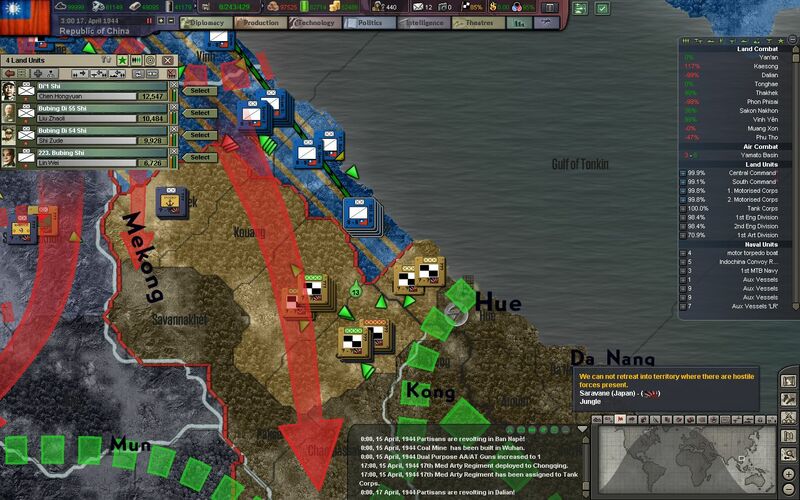 The first phase of Operation Ballroom, to advance onto the Mekong River, is achieved swiftly but not without considerable losses. 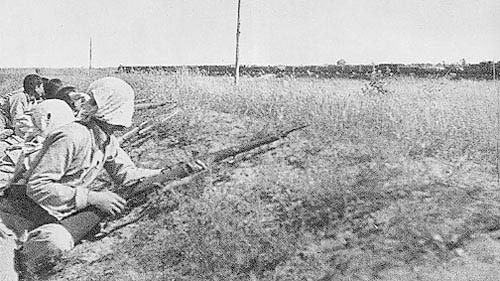 Fighting in the jungle, in which our troops face ambushes, snipers, and booby traps, have brought down many of our divisions down to just 60% of their initial strength. The NBIS begins to stretch its arms all over the world. 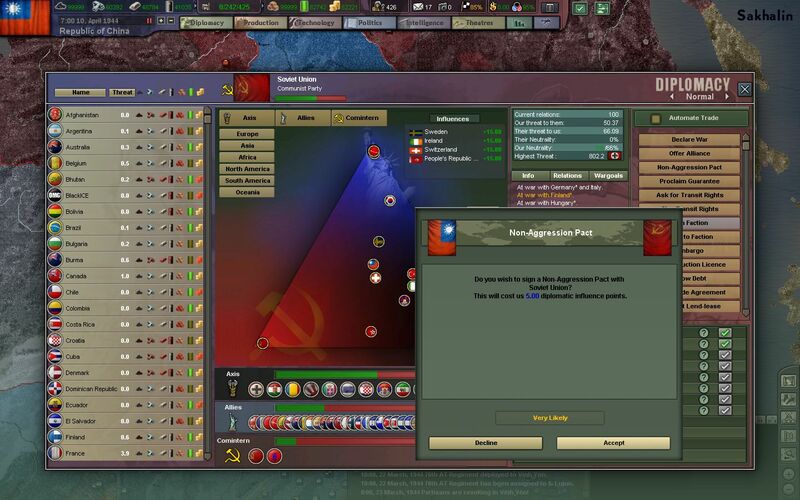 The first target for them outside of Japan is in Mongolia and the Soviet Union. The first attempt to cross the Song Ca River ends in disaster. 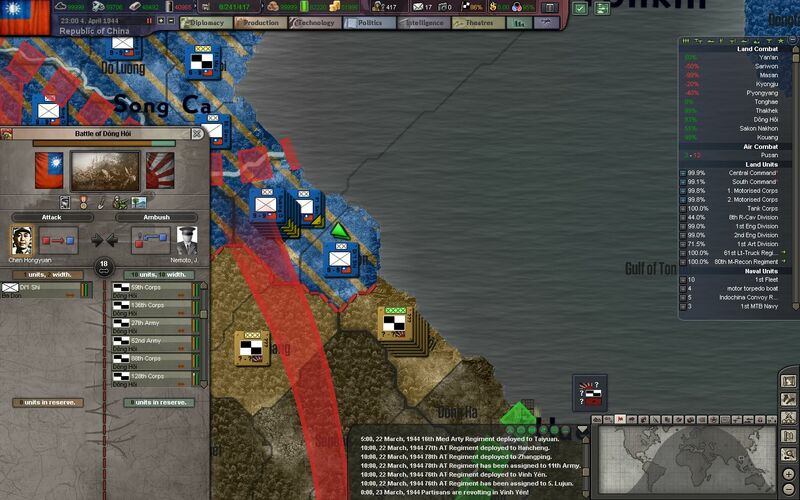 Japanese forces are well-dug into defensive positions across the river, and our engineers struggle to establish proper bridges to bring our troops forwards. ... and more conscripts are forced ashore. 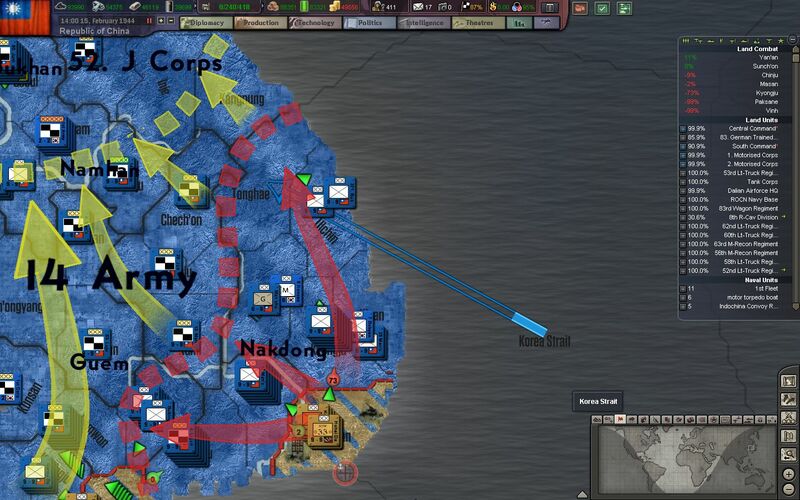 A few divisions lead a diversionary attack while the rest of Army Group Korea can prepare defensive positions around the coast. 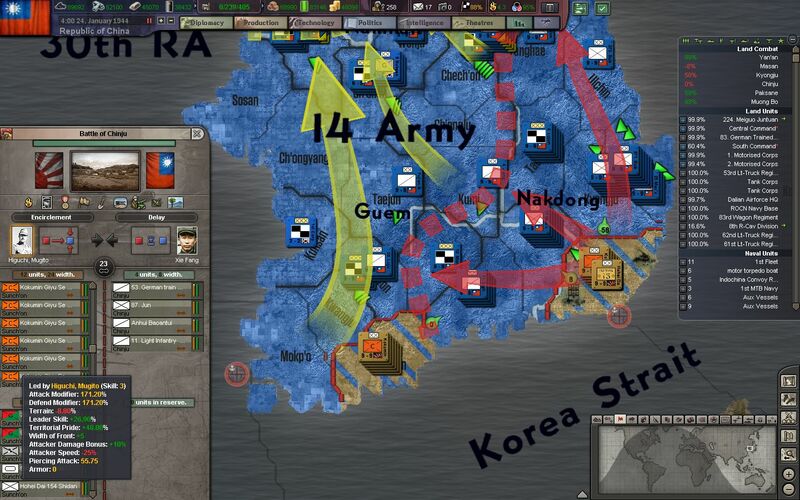 Another attempt by the Japanese at Pusan to break out of the city is stopped at Chinju, but not without extensive losses by the NRA defenders. 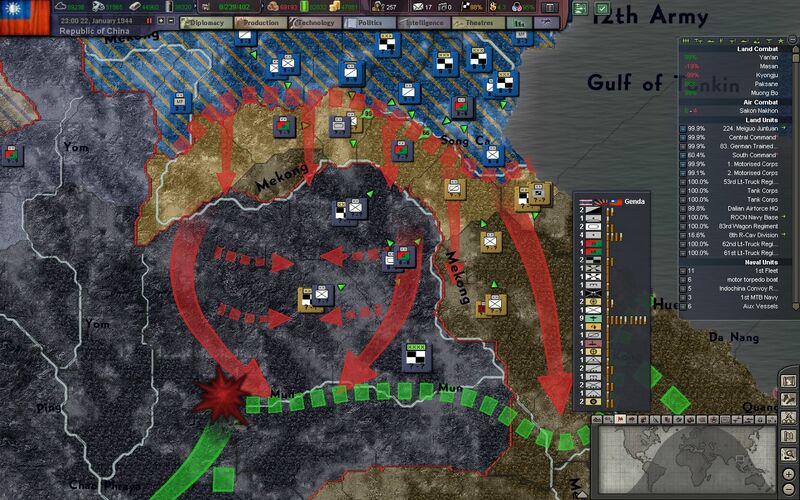 Artillery and air attacks are the new weapon of choice for the Japanese, who attempt to pound our positions into oblivion rather than relying on pure infantry force alone. 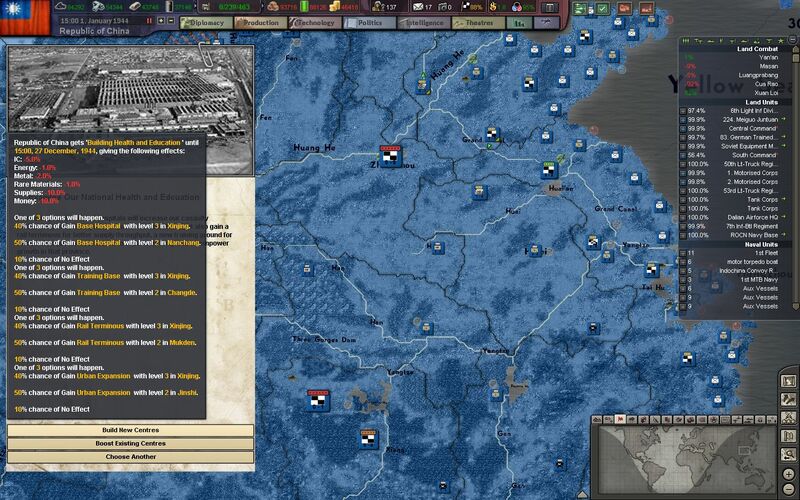 The ROCAF is already stretched thin with Japanese bombers and CAS roaming the lines in Indochina, and Japanese planes are at times given reign over the skies of Korea. The 5th Army fords the Mekong River at Phon Phisai, but is only barely able to establish defensive positions before being attacked by Japanese motorized units from the South. The NRA, which still lacks ubiquitous engineer corps and bridging equipment, relies on civilian ferries for transport across the Mekong. 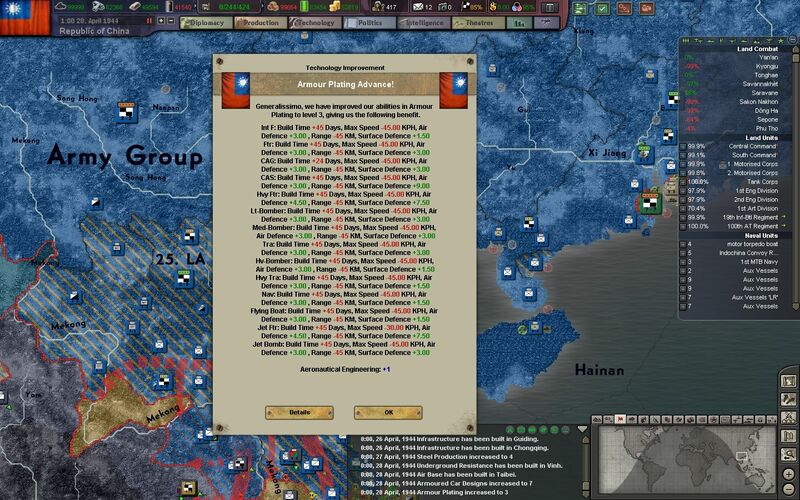 The Vietnamese people are more than happy to help our troops overthrow the oppressive Japanese regime. 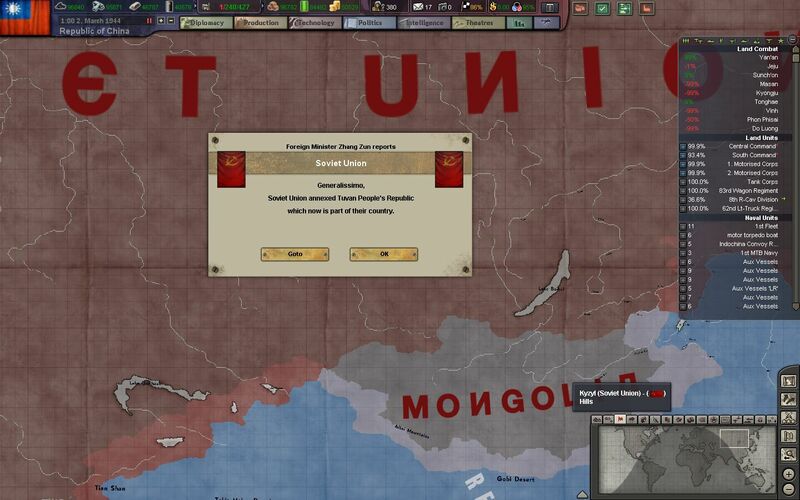 Tannu Tuva, which had been stolen by the Soviets during the Russian Revolution, is officially annexed into the Soviet Union. 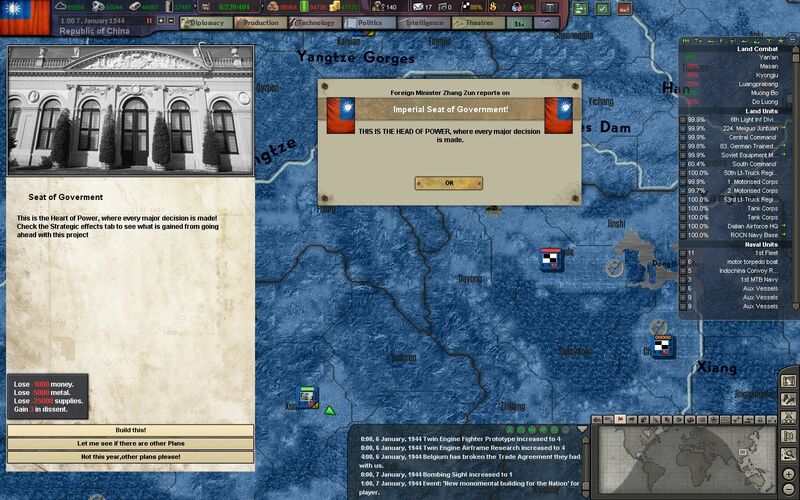 The Republic of China refused to recognize its independence, and now refuses to recognize its part in the Soviet Union. Field Marshal Bai Chongxi is sent to lead Army Group Korea, which now has nearly 300,000 Japanese troops in 3 pockets to contain. 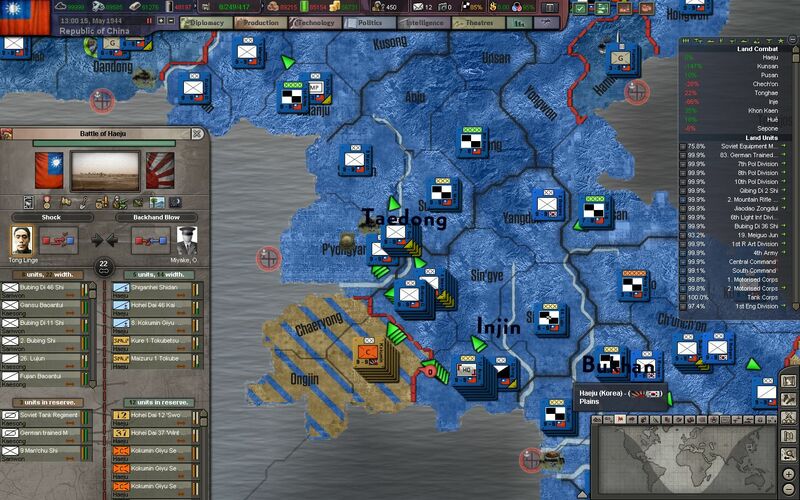 Under him are 4 field armies, two of which are veteran armies which have fought the Japanese for over 6 years. 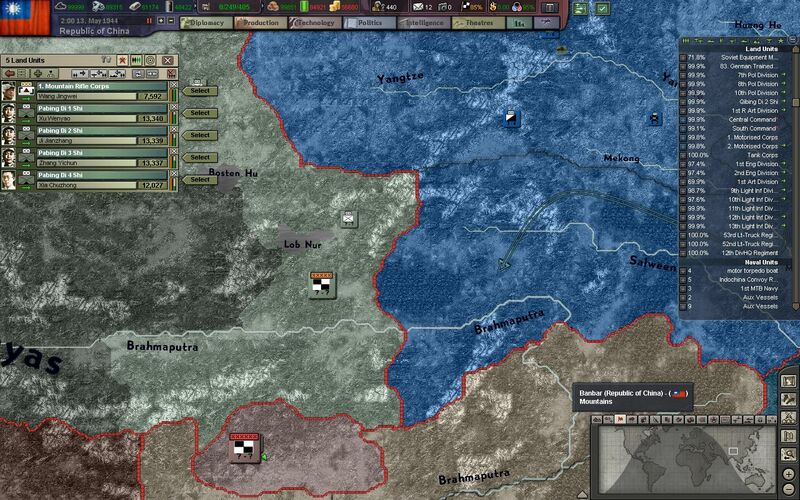 Two new armies, formed from former Manchurian soldiers and padded with new recruits, have born the brunt of the Japanese landings and have been left badly bruised. Japanese armor and marines are first on the beach, and as usual, a horde of conscripts follow in their path. 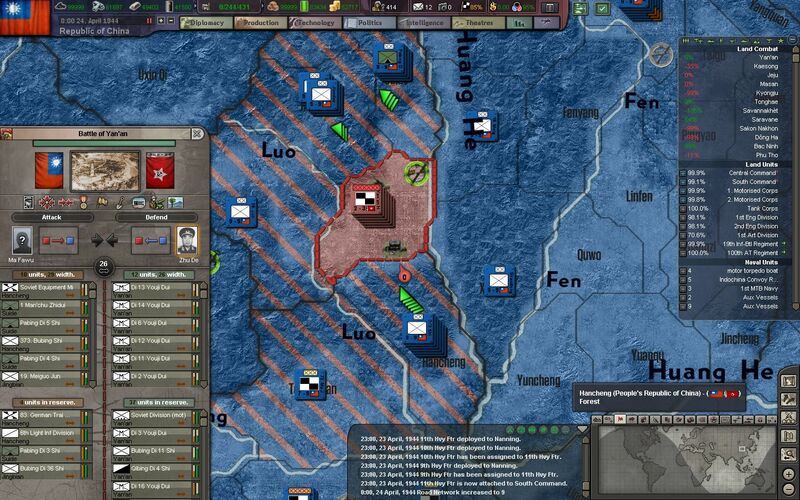 Only a lone division stands in their way, while reserves from the rear move to counter the invasion. 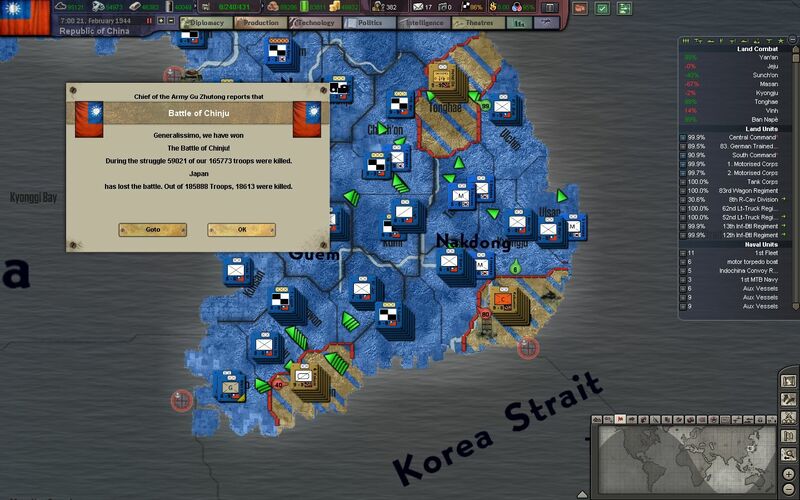 The invasion at Sunchon is the first to fail, with over 70,000 killed, while nearly 50,000 are captured by the NRA. 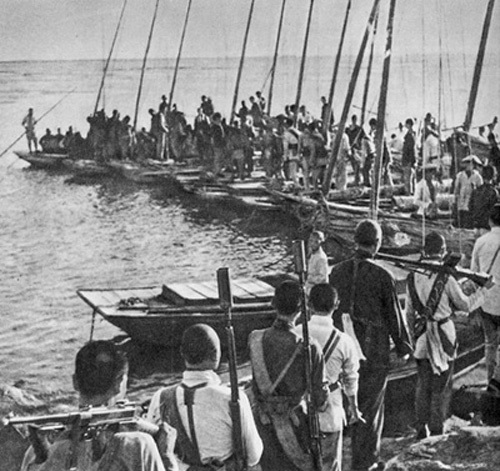 The rest of the invasion force hastily boards boats to retreat back into the ocean. 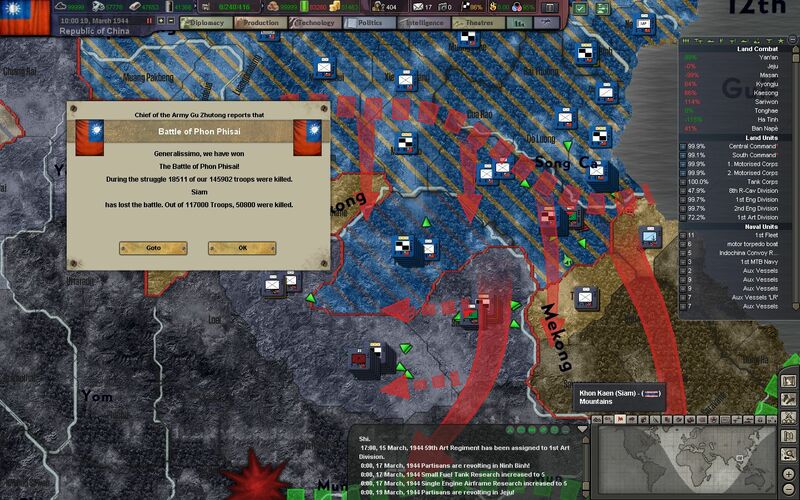 After nearly a month, the counterattack at Phon Phisai ends with the death of nearly 75,000 from both sides. The offensives of Operation Ballroom can now continue at full speed. 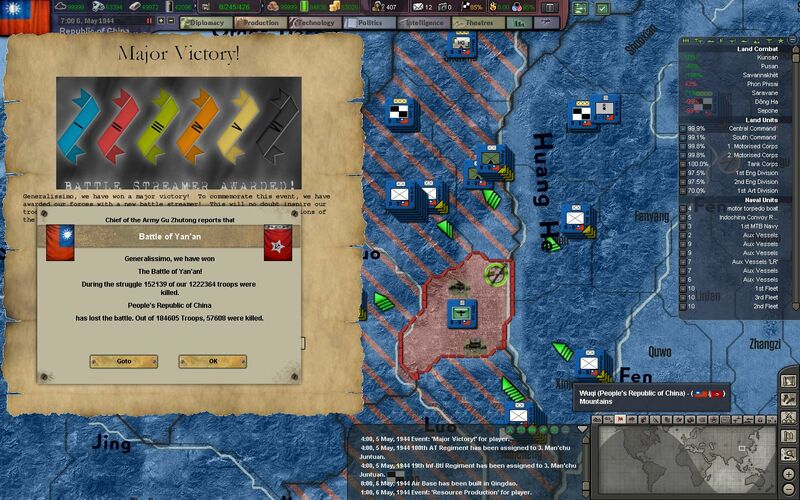 And at Ha Tinh, we finally secure both banks of the Song Ca River, and move down the eastern coast of Vietnam. Our scouts report that no more regulars stand in their way, and that the only thing ahead are supply depots, fuel dumps, and headquarter units. 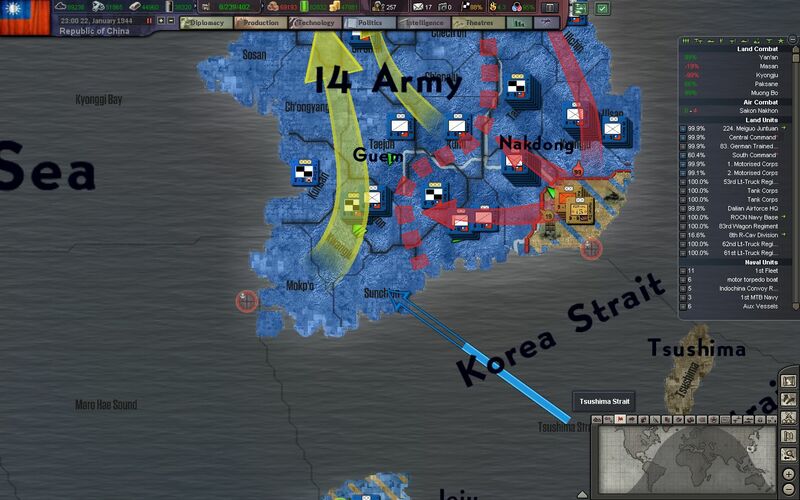 It seems we have finally broken through the front lines and reached deep into Japanese lines. Meanwhile, the assault on Yan'an, which has now been raging for over 6 months, is finally showing real progress. 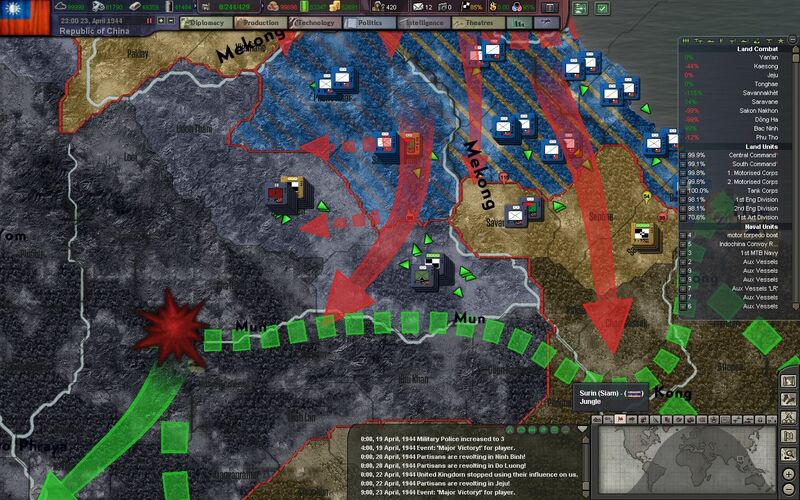 Ad-hoc "guard" divisions, consisting of elite assault infantry, heavy railway artillery, and the most experienced combat engineers in the NRA, have broken through the valley fortress's defenses and have begun fighting in the city proper. It is now only a matter of time before the communists break and surrender to the Republic. Taking notes from Wehrmacht doctrine, the NRA formally adopts new infantry tactics focused around machine guns and squad automatic weapons. Although the NRA lacks the versatility of a general-purpose machine gun like the MG34/42, these same tactics can be applied to guns like the ZB vz. 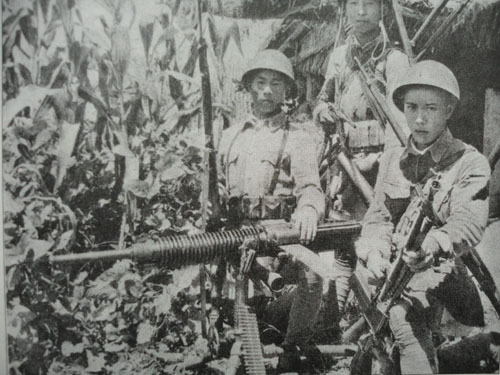 26, and captured Japanese LMGs like the Type 96 LMG. The lack of automatic weapons still plagues the NRA, especially in urban environments. 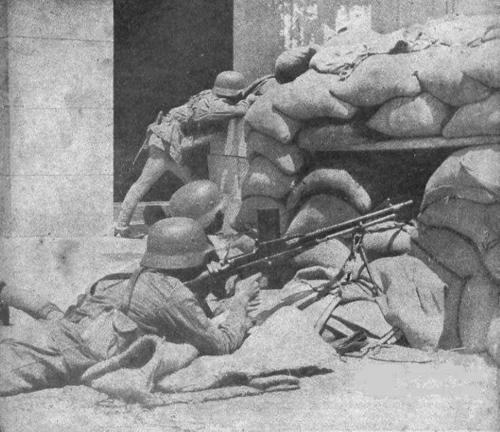 Clone copies of the MG34 are still entering mass production in our arsenals, and NRA clerks have begun to import large numbers of Bren guns from the UK through Burma. Additionally, copies of the German WWI MP-18 have entered production at the Taiyuan Arsenal, and will soon see combat in Korea. Another import of the Germans, the Flak 88 AA/AT gun, is also gaining traction within the NRA. Locally produced copies of the gun have already been received by frontline troops. Our forward elements are stopped by Japanese reinforcements 50 km north of Hue, their first objective. 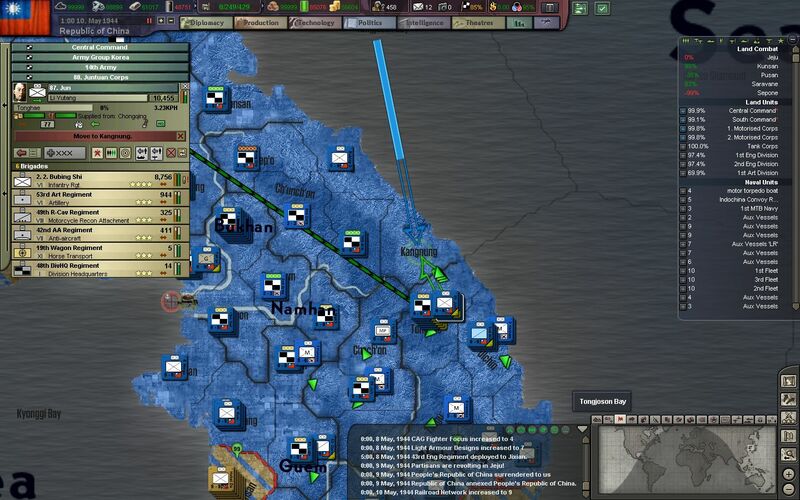 It would seem the Japanese high command have invested even more into Indochina that we have predicted. A final, last ditch attempt to stop our advance across the Mekong fails as the last banzai attack is silenced by the veterans of the NRA. 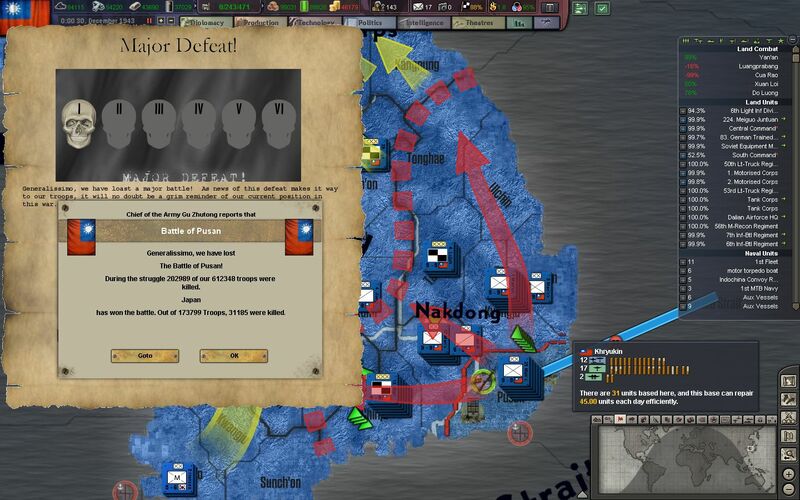 The Japanese generals, fueled by their false senses of honor and glory, have sacrificed their strength and defensive positions for shock attacks which have decimated and exhausted their men. Now the path forwards is ours for the taking. In Yan'an, the final regular garrison units occupying hardpoints on the outskirts of the city have been routed, captured, or destroyed. 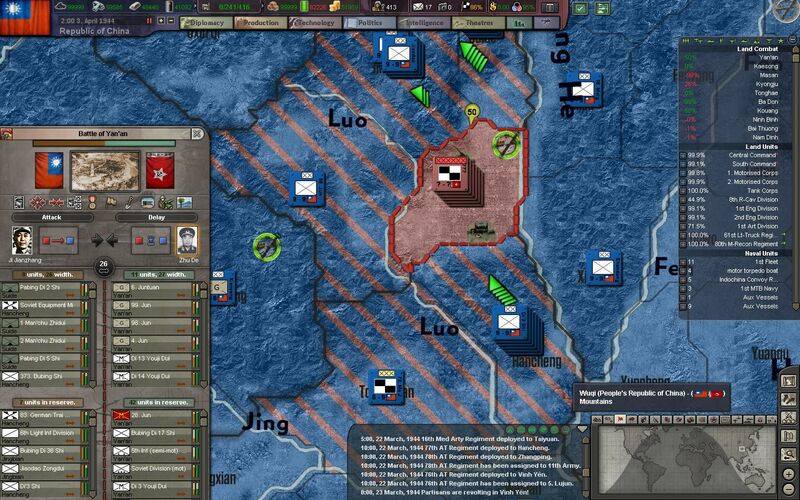 Our guard units, along with elite mountain troops, now fight poorly-equipped communist militia in the city streets. The fight for survival is familiar to the resilient troops of the NRA, but the communists in Yan'an fight with a vigor and ferocity that frightens even our hardened veterans. 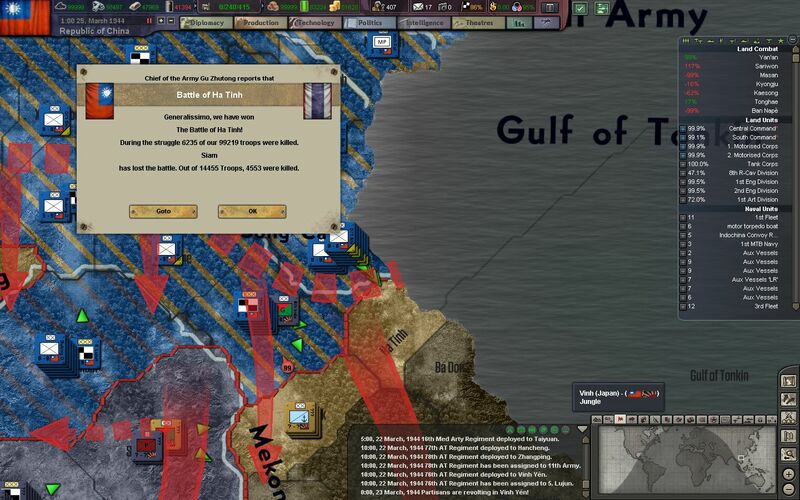 Attempts to clear city blocks with artillery and explosives only gives the communists more places to hide and ambush our troops. The ROCAFs poor performance against Japanese fighters has improved since its gradual adoption of monoplanes over interwar biplanes, but losses are still unacceptably high. Thick, metal armor plates have been introduced to lessen our losses, but at a cost of speed and maneuverability. 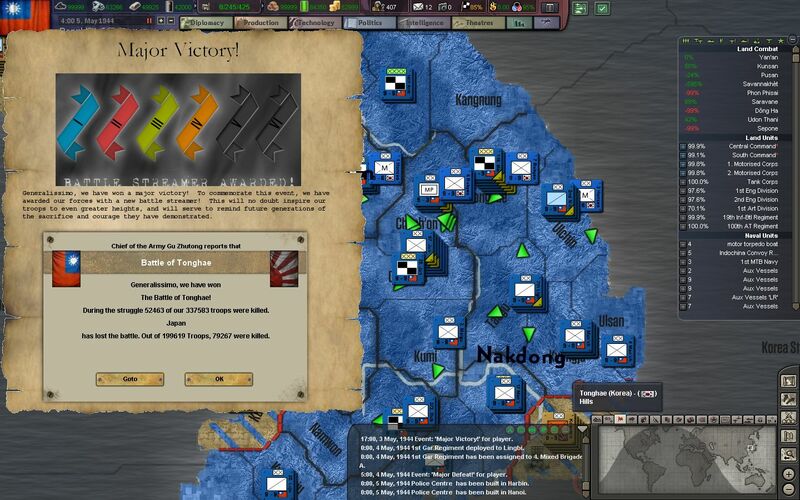 The Japanese continue with their landings, and refuse to give up their claims and rule over Korea. 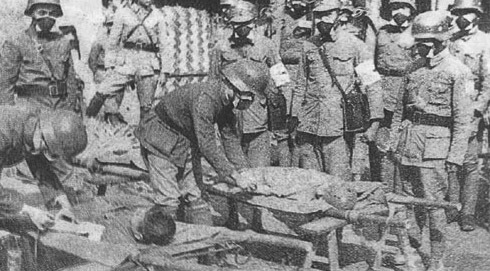 But as Japanese marines land to the West at Kunsan, another 200,000 are captured or killed at Tonghae. 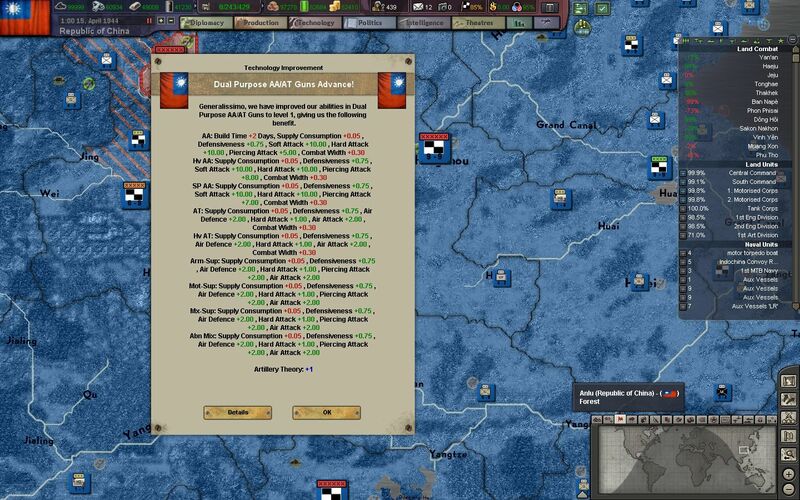 It seems that with the recent recruitment of conscripts in Japan, their high command is willing to send even more to their death in these pointless battles. 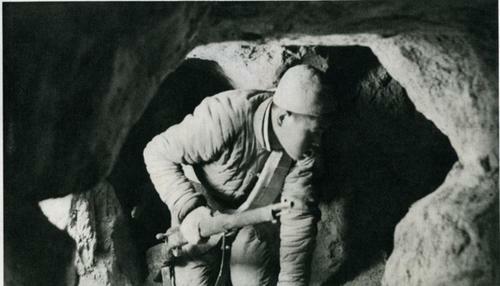 The Battle of Yan'an winds down as the defenders retreat into the tunnel network under Yan'an. These last ditch defenses, constructed by the communists during the siege, are vast in scope and in complexity. Our engineers work day and night to collapse them with explosives, but every day more fighters pop in and out of the ground to ambush our troops. The assaulting troops now rely on "tunnel rats", which go down into the network individually to weed out the last remnants of the CPC. 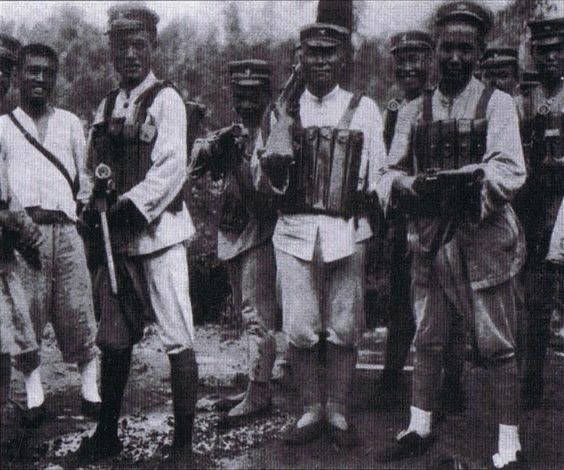 The lucky ones are given submachine guns, while most have to make do with Mauser pistols. The battle of Yan'an finally concludes when the underground command bunker is stormed by the elite 1st Shock Guards Division. 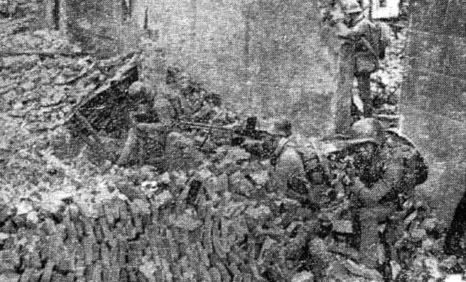 The communist leadership, including Mao Zedong, Zhou Enlai, and Deng Xiaoping are dragged through the streets and rubble to the siege headquarters of the 5th Army. 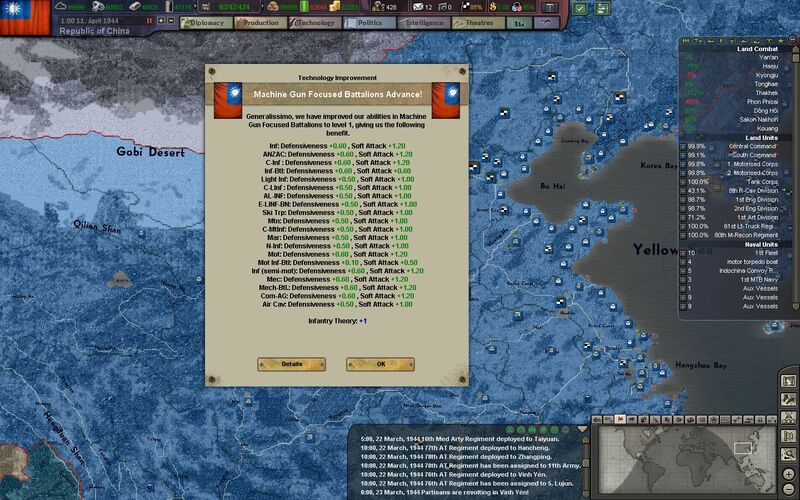 Over 150,000 NRA troops have perished in the streets and the valley of Yan'an, but now the communists are finally defeated. 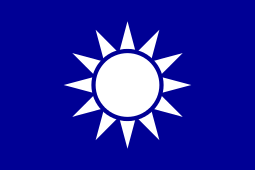 The CPC communist party is officially dissolved, and its leaders sent to trial for treason against the state and collaboration with the enemy. 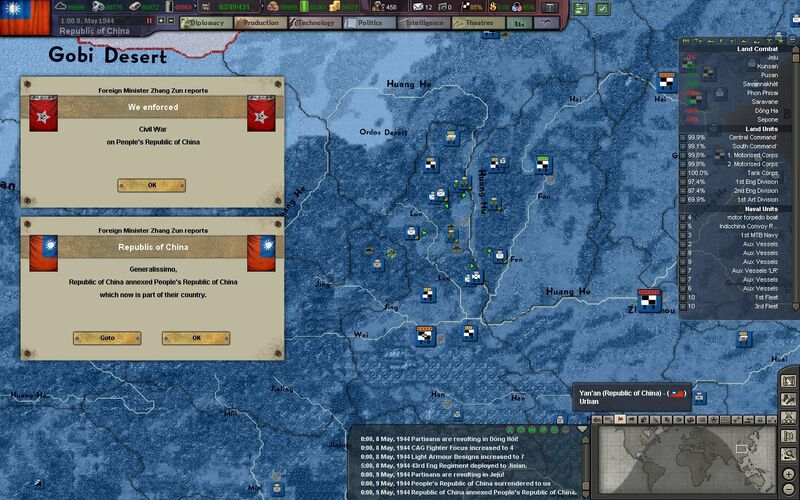 Most of the communists are captured, but some escape through the mountains and into Mongolia and the Soviet Union. 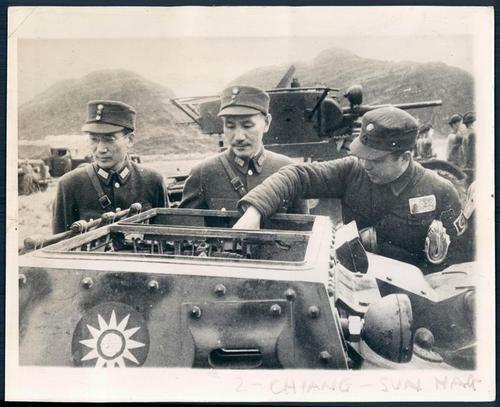 Generalissimo Chiang himself is present in the parades and parties, but he is chiefly there for the trials of Mao Zedong and his cronies. They will not be given the gift of a quick death, but instead their crimes will be published and broadcasted across the entire nation. 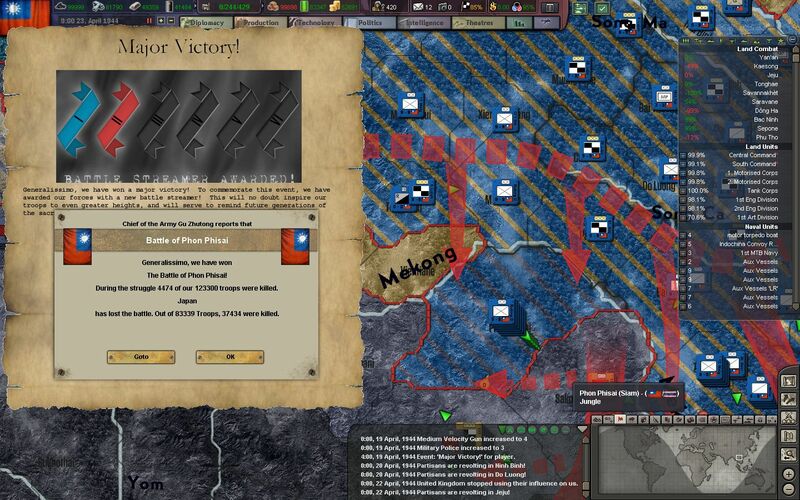 The Japanese continue to storm onto the Korean peninsula, but Army Group Korea stands strong. 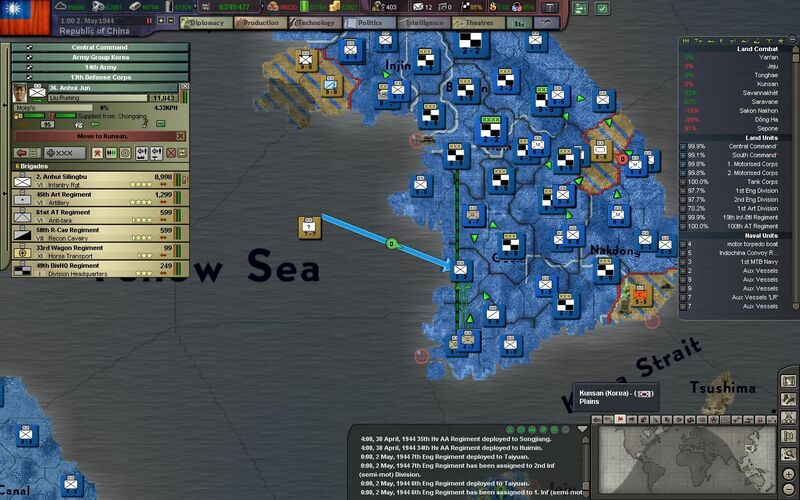 Recently reinforced by more units from the Manchurian campaign, it now has the strength to garrison the entire peninsula 3 times over. 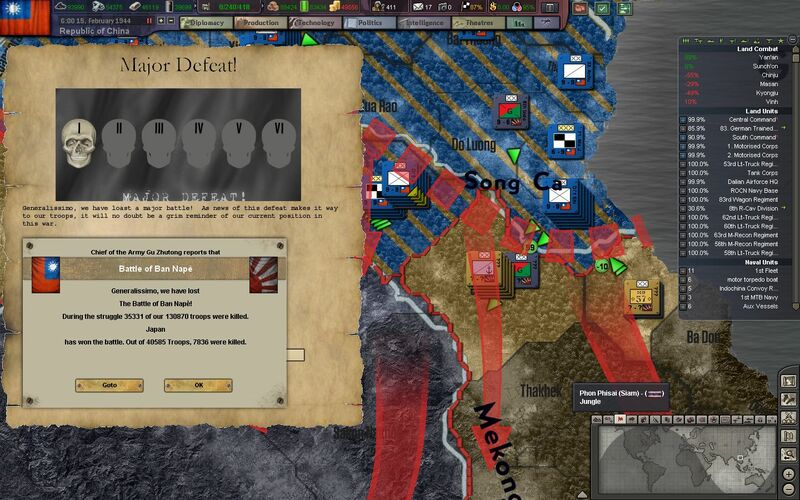 South of Pyongyang, Japanese marines and conscripts begin to run out of ammunition and supplies, and begin surrendering to NRA troops en masse. And in the South, the NRA is closing in on its first objective, in seizing the air and radar base of Hue. 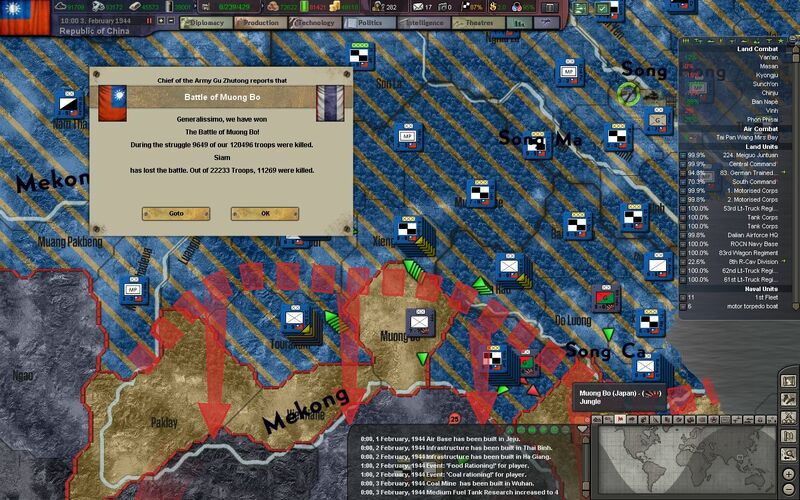 Nearly 400,000 men were involved in the final battle for Yan'an, but now their numbers can be distributed to Indochina in the South and Korea in the North. 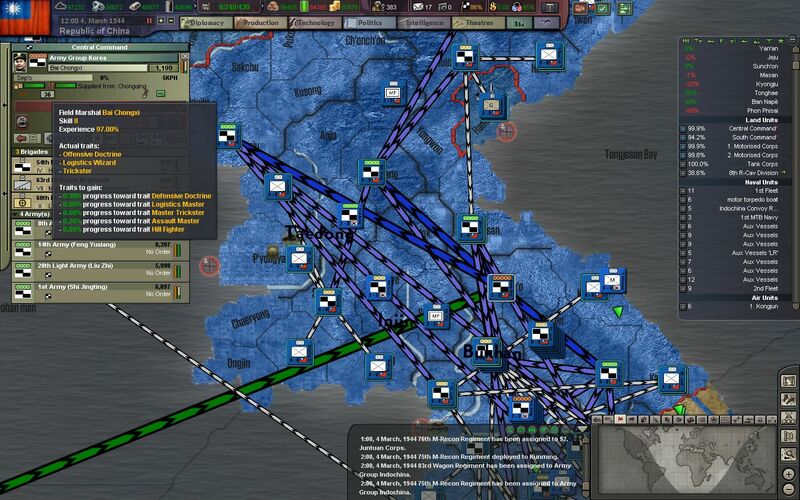 ...while the 4th Army is sent to bolster our forces in preparation for phase 2 of Operation Ballroom. Thanks for reading! Check back on Mondays for new episodes. 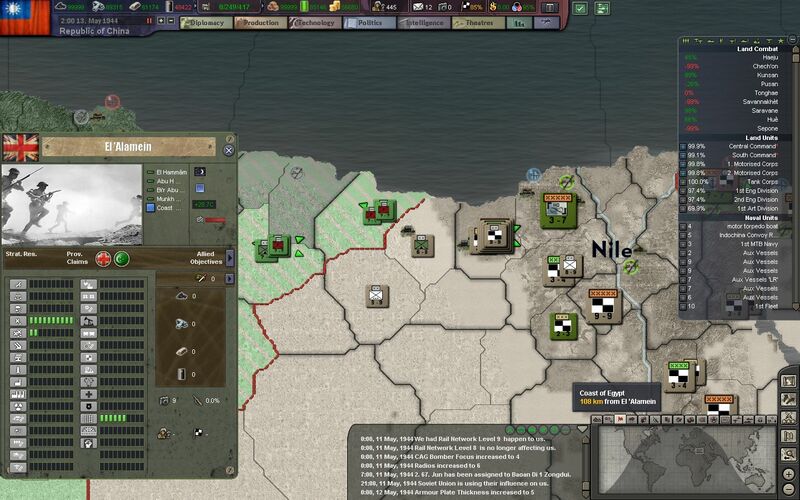 As always feedback on history, gameplay, decisions, military tech, etc. is welcome in the discussion thread.